It’s that time of year when the snow falls quickly and starts to pile up. If you are not careful while shoveling, all that bending and lifting can put you at serious risk for injury or even a heart attack. Snow removal can be especially dangerous if you do not exercise regularly and are over the age of 40. The most common injuries associated with snow removal are in the muscles, tendons, and discs of the low back, shoulders, and neck. Heart-related problems account for only 7% of shoveling injuries but can be deadly. Cold weather constricts your arteries which raises your blood pressure and pulse rate. It can also make your blood clot more easily. These factors in addition to the extra workload while shoveling can put too much strain on your heart and lead to a heart attack. Below you will find some tips to help you avoid injury while shoveling this winter. Take frequent breaks every 20-30 minutes especially when the snow is wet. Keep up with the snowfall. Try to shovel snow shortly after it falls, when it is lighter and fluffier. The more extended snow stays on the ground, the wetter it can become. Wet snow is heavier and harder to move. Also, clear the snow every few inches instead of waiting for the snow to stop falling before you head outdoors. Wear breathable layers of loose clothing so you can peel a layer off if you get hot. Avoid wearing heavy wools, manmade materials or other materials that don’t allow perspiration to evaporate. Better choices are cotton and silk. Wear waterproof boots with excellent traction. Good traction is critical to ensuring that you don’t slip and fall. Drink lots of water to stay hydrated. You should drink water as if you were enduring a tough workout at the gym or running five miles. Carry your cell phone with you so you can make a call in the event of an emergency. 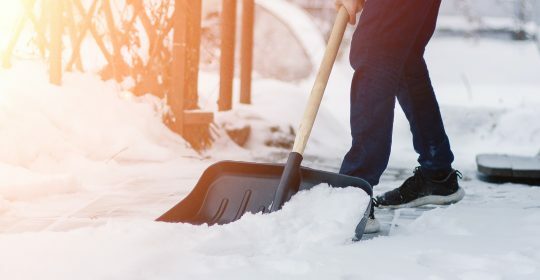 Having recognized that snow shoveling can injure your back, shoulders, and neck, here are some tips to help you avoid these problems. Choose a snow shovel that is right for you. Be sure that your shovel has a curved or adjustable handle, as this enables you to keep your back straighter when shoveling. Obtain a shovel with an appropriate length handle. The length is correct when you can slightly bend your knees, flex your back 10 degrees or less, and hold the shovel comfortably in your hands at the start of the “shoveling stroke”. A plastic shovel blade will be lighter than a metal one, thus putting less strain on your spine. A smaller shovel blade is better than a more massive blade. A small blade can’t shovel as much snow, so it reduces the risk of picking up too much snow at one time. Your shoveling technique is essential. If you must lift the snow, lift it properly. Always face towards the snow you intend to lift – have your shoulders and hips both squarely facing it. Squat with your legs apart, knees bent and back straight. Lift with your legs and do not bend at the waist. Scoop small amounts of snow onto the shovel and keep your loads light. Do not lift snow that is too heavy for you. Keep the most massive part of the shovel close to your body at your center of gravity (waist level) – do not extend your arms to throw the snow. Holding a shovel of snow with your arms outstretched puts too much weight on your spine. Walk to where you want to dump it rather than reaching or tossing. Never throw snow over your shoulder. Don’t remove deep snow all at once. Shovel an inch or two off the top and then repeat until it’s gone. Remember that wet snow can be very heavy. One full shovel load can weigh as much as 25 pounds. Remember to move your feet rather than twisting. Step in the direction in which you are moving the snow to prevent the low back from twisting. Always pivot your whole body to face the new direction. Consider buying a snow-blower. When used correctly, a snow-blower will put far less strain on your back than snow shoveling. Avoid stressing your back by using the power of your legs to push the snow blower while keeping your back straight and knees bent. By following these tips, you are far less likely to be injured while shoveling snow this winter! Stay safe!